What a drawn out saga this is! Yesterday Sebeco left the harbour close to the shipyard she was built in, crossed the Aegean and arrived first of all at Panormitis, to be blessed, and then Yialos. She moored overnight at the location ANES always used in the past, by the bus terminus. 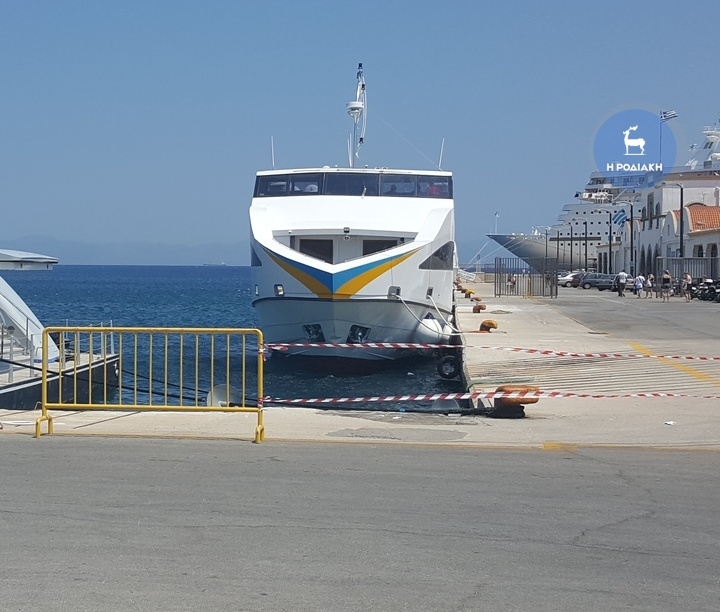 This morning she left Yialos about 15 minutes late, probably due to ceremonies, and arrived in Rhodes at the Tourist Port quay, at the very landward end, which as a shallow-draught vessel is possible. For those who aren’t sure precisely where this is, this is the quay in between Kolonna and Akandia that is used by ferries to Turkey and by the vast cruise ships (though they need to dock further along or run aground). Presumably this is where they intend to depart from as well, but the 10:00 departure is now 35 minutes late (more ceremonies, perhaps) and still hasn’t left.Update – I’m informed that the ship met some rocks while entering harbour and is now out of service for repairs until further notice.Later still update! The Rodiaki newspaper reports that Sebeco arrived safely, and the damage was actually caused while about to depart for Symi when a yacht “scratched” Sebeco, which in turn caused her to collide with the quayside. There are dents and scratches at the bow and on one side. Sebeco moored at Tourist Port, Rhodes, after damage. Photo copyright Rodiaki. At this location there is an octagonal wooden building that Sea Dreams has been using as a ticket office and the suggestion is that ANES will share the building for on the spot sales and collections of tickets booked on line. They have always had an office in Australias Street, but this has been more administrative than a sales point, even when they managed to operate 4 ships between Rhodes and Symi in the “good old days”. The Panagia Skiadeni it is then and a free tour of Panornities – thanks for the running update. I came across your blog while Googling the Sebeco. I was on the Sebeco when it crashed yesterday and I can tell you for sure it wasn’t scratched, or touched by any other boat to cause the crash…for whatever reason after reversing out, the boat drove directly into the wall, then continue forwards along the wall taking out the mooring lines and narrowly missing the Mayan Queen luxury yacht before sending us all flying after hitting the wall at the end. We had no apology, explanation and anyone associated with the ANES swiftly scarpered off. In either case the Rhodes newspaper seems to have been fed a highly misleading explanation. I wonder what ANES told the coastguard officers? The Commercial Harbour is a specific point in the port complex. The signs at the entrance say “Tourist Port” . This is one of several quays jutting out from the shore into the sea, and is the one also used by ferries to Turkey and by cruise liners. It is one of two quays that are next to the walls of the Old Town, but you’ll see it very easily as the vast cruise ships overshadow the whole port.